Me and my daughter have both been contemplating on relaxing our hair for the longest time. I told myself a few years ago that if I still want to relax after a year passes then I will take the plunge. But if it was just an itch that I may regret later it will pass and after the year is up I will no longer want to relax. Well its been more like 2.5 years... and the itch is still there. My daughter on the other hand, I love her texture, but I have to admit that it is quite a challenge getting her hair done. We have not had as much free time as we would like to have in order to keep up with our hair the way it should be taken care of. I asked my lady and explained to her very carefully about relaxing her hair. She said yes. She is very smart being only 6 years old and she definetly knows what she wants. Now, when I say relax, I do not mean Straight.. I am relaxing to reduce the amount of shrinkage and lossen the curl only. I am keeping as much texture as possible but leaving the possability for her to wear curls, straight styles, and also for her to be able to do her own hair. 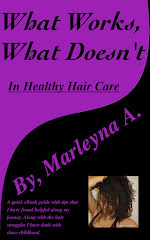 She is a beauty fanatic like myself and loves to do hair. 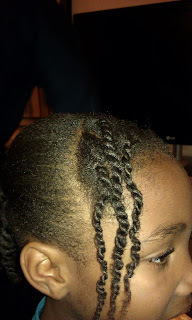 She knows how to braid and twist at her age, which is fascinating because I myself did not teach her! She learned all on her own. The process we went through was a little tedious but the results were beautiful and exactly what I hoped for. I started by applying conditioner to her hair and let it sit for a while. I separated her hair into 3 sections and started with the back. I applied a lye relaxer by optimum to the back section and completely covered every strand while smoothing lightly. 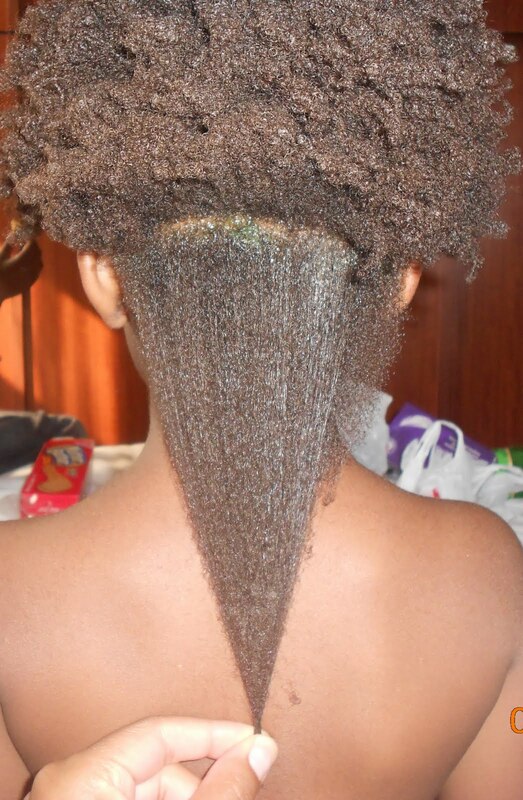 I left the relaxer on for less than 5 minutes before rinsing the section clean. 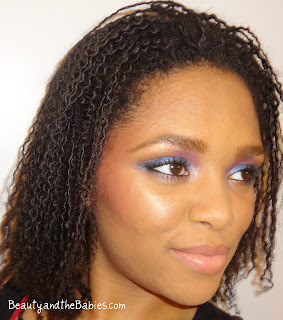 I shampooed twice and applied deep conditioner and tied that section out of the way. I did the same process for each section and shampooed her entire head a few more times. Deep conditioned again leaving in overnight. 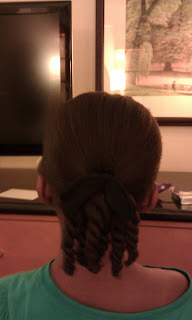 Rinsed out in the morning and applied leave in conditioner braided her ends up and put it in a bun. She absolutely LOVES her hair like this!! It hangs now and she likes that it layes on her back instead of shrinking up. 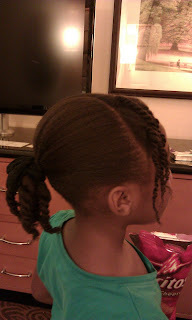 Here is a pic of her natural texture. 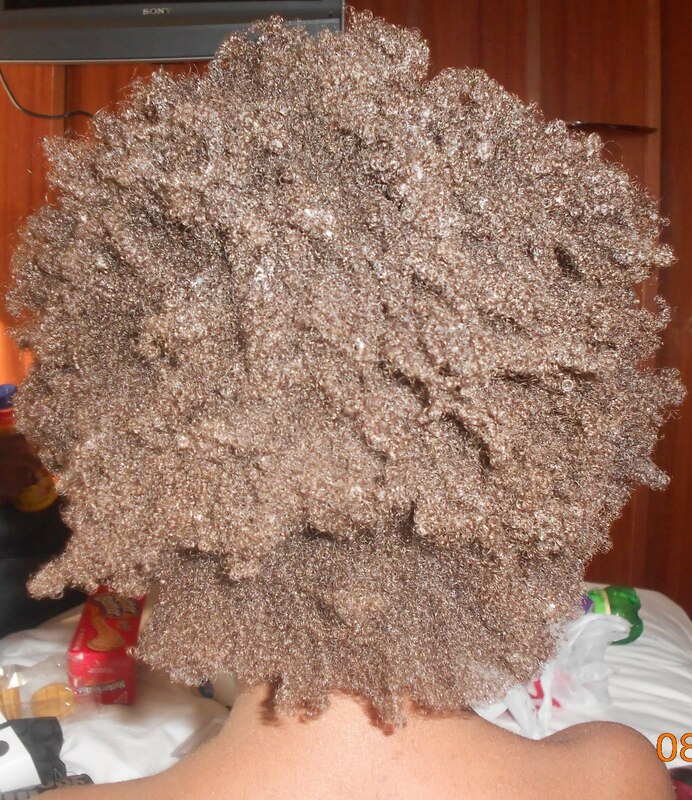 This is the very back section stretched to show the crazy amount of shrinkage she naturally has. This is the back section after it has been relaxed. As I said I did it one section at a time. ﻿I didnt get a pic of her entire head relaxed but will post that as soon as I rinse the conditioner that she currently has in out. Her ends are a little thin and I did give her a nice trim. After the relaxer her hair actually resembles my hair. Its so soft and so much easier to comb. It used to take me hours just to get through and detangle her hair now it takes minutes. Here is what it looks like today. A very simple style. If these twists were done on her hair before the relaxer they would have shriveled up into nothing! There are no straight pieces and I did a treatment with Motions CPR to give her a little protein. 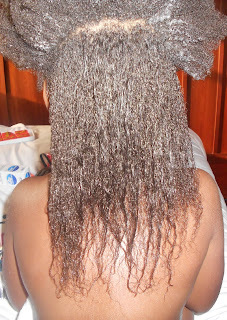 Her texture is very similar to what it was before, just less shrinkage which was our goal! The relaxer was left on for less time in last section on the top right. That section is a little more poofy so next time we will have to spend a little more time there.